Violent thunderstorms tore through the Wabash campus last April, leaving a path of fallen trees, broken limbs, and superficial damage to a handful of buildings. More significantly, heavy rain and high winds recorded at nearly 100 miles per hour also claimed Kingery Hall, which will be demolished in early January. The storm’s path took it directly over Kingery Hall. Winds tore the roof off the building, as well as limestone caps and significant portions of brick superstructure. Over an inch of rain later fell on the unprotected building, further damaging the interior. After months of study, architects and engineers have determined the storm damaged too much the building, and that restoring it would not be cost effective. "We’ve studied every possible course of action, and in examining the recommendation of our architectural and engineering firms, we have elected to raze Kingery Hall," said President Pat White. "Of course we had hoped all along we would be able to restore Kingery to its historic stature, but there were too many doubts about the building’s structural integrity." After crews have cleared the site on the southeast corner of campus, architects and contractors will construct a new facility on essentially the same footprint. The new building will house the Wabash Center for Teaching and Learning in Theology and Religion. "The structural engineers told us the only part of Kingery Hall that could be saved were the four outside walls and even they are questionable," said CFO Larry Griffith. "It just makes sense to bring it down and start over, in terms of both cost and structure." Over the last decade, Kingery Hall had been used to house emeritus faculty offices, a Macintosh computer lab, and the Advancement Office’s telephone calling center. 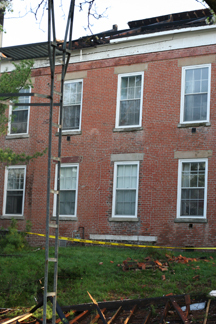 Built in 1854, Kingery Hall was Wabash's oldest classroom building remaining in its original location. Its first purpose was as a preparatory school for students who would later enroll at the college, one of whom was Lew Wallace, Civil War general and author of Ben Hur. From 1891 to 1916 it was home to professor Hugh Kingery. Throughout the century it was used as a classroom, dormitory, and even a campus infirmary. "We understand the sentimental and historical value of Kingery Hall, and it is our intention to honor that history in some fashion within the new facility," added President White. Discussions with the Indianapolis-based Browning Day Mullins Dierdorf Architects on the shape and scale of the new facility are well underway. Demolition crews will begin razing Kingery Hall while construction plans are finalized. Griffith believes construction could begin in early spring. "The project will be paid for by Wabash Center grants funds," added Griffith.